Huge progress has been made on the Korean peninsula, but all of the gestures of good will from the North Korean leader could soon unravel. The North Korean leader has canceled a high-level meeting with South Korea and threatened to end negotiations with the U.S. President Donald Trump. North Korea's Kim Jong Un is slated to meet with President Trump on June 12 at a historic summit in neutral Singapore. The cause of the current dispute is a series of military exercises between Seoul and Washington that Pyongyang, North Korea's capital, condemned as rehearsals for invasion. North Korea's state media issued the surprise declaration in an early morning dispatch in what could be an ominous sign of hostility. After all, the country did spend the last several years posturing and testing ballistic missiles with potential nuclear capabilities. At this point, the announcement from Pyongyang that the joint military exercises are perceived as a threat could just be an effort to gain a bargaining edge leading up to the planned summit. It could also be the sign of an actor who is putting on a front and the true intentions are leaking through the disguise. Perhaps Kim Jong Un never had any intention of actually meeting with U.S. President Donald Trump, but if that is true, he has certainly gone out of his way to give appearances to the contrary. Newly appointed United States Secretary of State Mike Pompeo has been flying to North Korea in a series of secretive meetings with Kim Jong Un. At least one of those meetings was positive and resulted in the release of three U.S. detainees being held in North Korean labor camps. South Korean President Moon Jae-in even met Kim Jong Un at the demilitarized zone in an unprecedented gesture of peace which marked the first time a North Korean leader stepped across the border into South Korea in decades. The announcement from Pyongyang came hours before the two Koreas were set to meet at a border village to discuss how to reduce military tensions along the heavily fortified border. 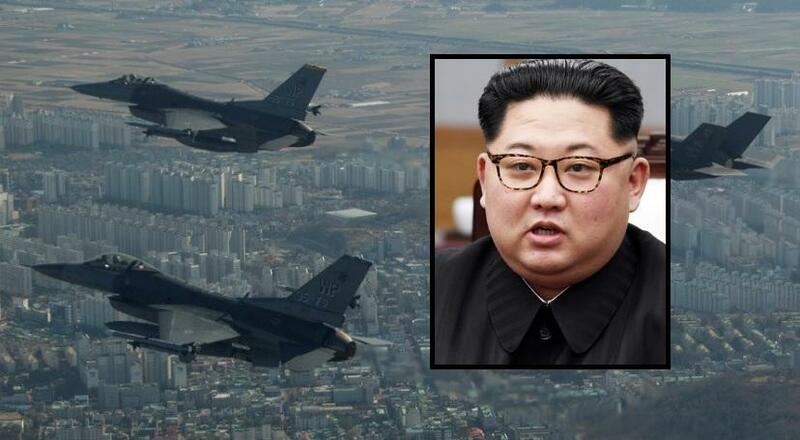 According to the North's Korean Central News Agency, the military drills which began Monday and reportedly included around 100 aircraft was an "intended military provocation" and an "apparent challenge". The North said in a statement, "The United States must carefully contemplate the fate of the planned North Korea-U.S. summit amid the provocative military ruckus that it's causing with South Korean authorities. We'll keenly monitor how the United States and South Korean authorities will react." This is the kind of the thing the Dems would be behind, just screw Trump..
Who's stupid enough to have military drills right now? The deep state is probably behind this crap and want a world war. The sooner we put these criminals away the better! I as thinking the exact same thing <26207> Why the hell would we not take a month off from drills w/SK?? This stinks of the "deep state" and their attempts to make Trump look bad at any cost to America or even the world. We need to see the crooked politicians get perp walked and there is plenty of proof of crimes in the public sphere and probably plenty more we are not privied to.